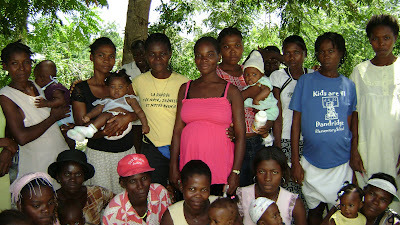 Marcia has sent us a prenatal clinic report for September. She said at St-Helene there are 6 pregnant women who will give birth before the end of the year. There are 2 new baby boys . They're planning on having a party on December 22nd. 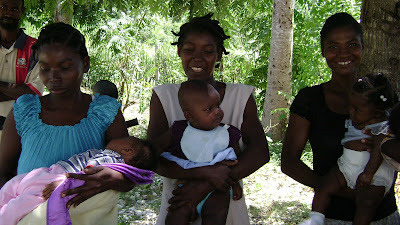 At Camp-Perrin there are five pregnant women and 3 new babies. I'm so excited because I am beginning to recognize faces of the women. The woman in the middle on the top photo made a trip to St. Elen to see us in June just to thank us for giving her a fleece blanket. Isn't it strange to think that a fleece blanket in Haiti would be so welcome? Her baby was little then, but he's grown to be pretty healthy by the grace of God. We've received donations of baby's clothing from members of our church; it will be fun to see some of that clothing on the little babies. Surgeries: I've heard from Amoce that the woman with the breast cancer has declined surgery. The American doctors seemed to think it was pretty serious and wanted to do a full mastectomy, but she didn't want it. This is so frustrating to be this far away and not know what to do to help. I'm sure there's a cultural gap, and there's also the issues of surgical aftercare, etc. The woman with the lipoma on her forehead would not go to see the surgeons because her daughter is very sick. We offered to pay for having her daughter see the doctors, too, but it seems as though her daughter may be dying. She has stopped eating. She said she just wanted to stay home with her daughter. The man with the large, football-sized lipoma did not come to the clinic in Laprivye when Witchner and Amoce were there; they were unable to find him. Again, this is so frustrating because everything was going more smoothly before Hurricane Dean prevented the American surgeons from travelling to Haiti in August. We've had generous donations for these surgeries and the funds will remain in an account that will be used only for this kind of intervention. Next time we're in Haiti, in February, we will now have the potential of reacting more quickly to get some of these people to a surgeon. Dr. Mark has talked about taking another surgery course so that he's able to do more of these in the field. Witchner's mother's funeral was this past Saturday. He wrote a wonderful letter to us saying that he was able to conduct the whole funeral with strength because he relied on the comfort of God.